Figure 7-26. - Reciprocating hermetic compressor. 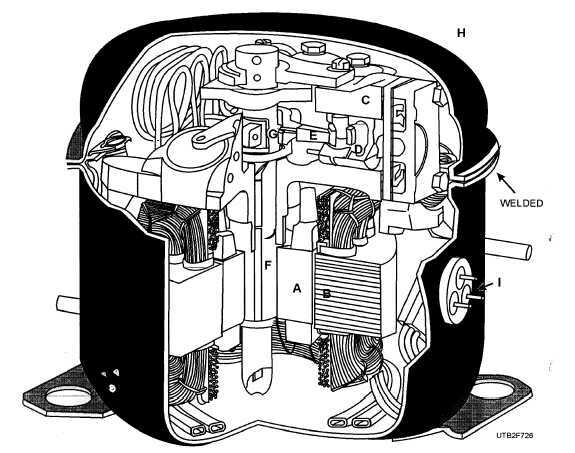 (A) Motor rotor; (B) Motor stator; (C) Compressor cylinder; (D) Compressor piston; (E) Connecting rod; (F) crankshaft; (G) Crank throw; (H) Compressor shell (I) Glass sealed electrical connection. hermetically sealed units whose motor windings may be attacked by acids or other corrosive substances introduced into the system or formed by the chemical reaction of moisture, air, or other foreign substances. HERMETIC. - The term sealed or hermetic unit merely means that the motor rotor and compressor crankshaft of the refrigeration system are made in one piece, and the entire motor and compressor assembly is put into a gastight housing that is welded shut (fig. 7-26). This method of assembly eliminates the need for certain parts found in the open unit. These parts are as follows: motor pulley, belt, compressor flywheel, and compressor seal. The elimination of the preceding parts in the sealed unit similarly does away with the following service operations: replacing motor pulleys, replacing flywheels, replacing belts, aligning belts, and repairing or replacing seals. When it is realized there are major and minor operations that maintenance personnel must perform and the sealed unit dispenses with only five of these, it can be readily seen that servicing is still necessary. Rotary compressors are generally associated with refrigerators, water coolers, and similar small capacity equipment. However, they are available in larger sizes. A typical application of a large compressor is found in compound compressor systems where high capacity must be provided with a minimum of floor space.